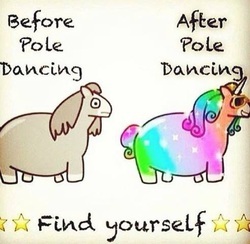 You've heard of pole fitness but you're not sure whether it's for you? Too embarrassed? Think people will stare at you as you claw your way up on to the pole? This is the time for a new addiction! For over a year I was too scared to book myself into a Pole Fitness lesson. What on earth would I look like? But I DID want to. I did want to wear the hotpants and spin around trying to look graceful!